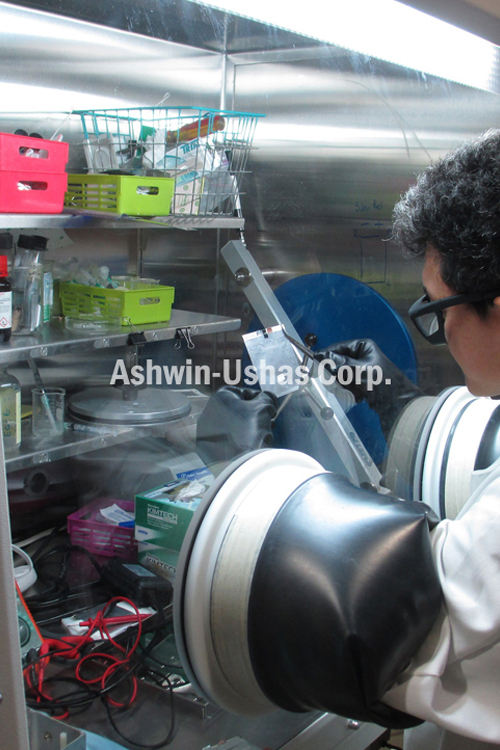 About Ashwin-Ushas Corp. Inc. | Cutting Edge Technology | Ashwin-Ushas Corp. | Ashwin-Ushas Corp. Developer of advanced technologies in the defense, aerospace, space, materials and environmental fields. A world leader in infrared (IR) electrochromics technologies for terrestrial camouflage. A world leader in Variable-Emittance technologies for spacecraft thermal control. A world leader in Conducting Polymer technologies for a very wide variety of applications, ranging from vapor-control membranes, to sensors, to IR electrochromics, to electrochromic sunglasses. An innovator of green environmental technologies such as medical waste remediation and bioremediation. Significant, worldwide patent portfolio in technologies as varied as electrochromics, waste remediation, sensors and microcontrollers. Small but state-of-the-art research laboratory with highly multidisciplinary capabilities in chemistry, synthetic chemistry, electrochemistry, polymer chemistry, materials science, aerospace testing, electronics engineering and microbiology. Founded in 1992 as a research company.